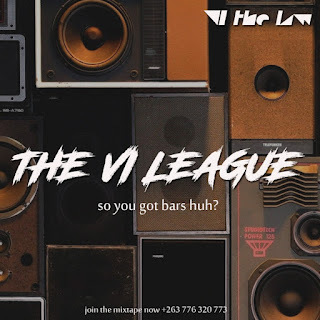 The VI League is a mixtape series created by Harare based Rap Artiste/Producer VI The Law that challenges different rappers to create different songs all from one instrumental provided by VI. The VI League is a mixtape series created by Harare based Rap Artiste/Producer VI The Law that challenges different rappers to create different songs all from one instrumental provided by VI. All the different songs are then compiled into a mixtape called The VI League Mixtape. The rappers with the most popular songs will be invited to do a cypher video to further display their talent and give them a chance to captivate an audience when the video is uploaded to YouTube and Facebook. The VI League is open to all rappers regardless of style…and there are no guidelines as to how one tackles the instrumental to ensure authentic expression. The intention behind The VI League series is not only to promote upcoming rappers but also an opportunity for rap artists to sharpen their skills in the spirit of healthy competition. It will also give the general public a chance to discover new rap acts who they might not have had access to. The 8 rappers featuring in the first mixtape are Flick Stizzo, King John II, MegaChainz, Cole, Reap3r, KayFelo, Nate Havoc and Massey.